Eager to catch information of latest and upcoming Bollywood movies 2015? It lists best 2015 Bollywood Hindi movies for reference. In 2014, Bollywood film industry ushers in a flouring period for glorious commercial success of Hindi movies receiving an extra high box office worldwide, especially PK, a comedy drama film released on December 19, 2014 making highest global gross ever in Rs. 6.07 billion ($95 million). For 2015, it is believed that Bollywood movies can make a new history. 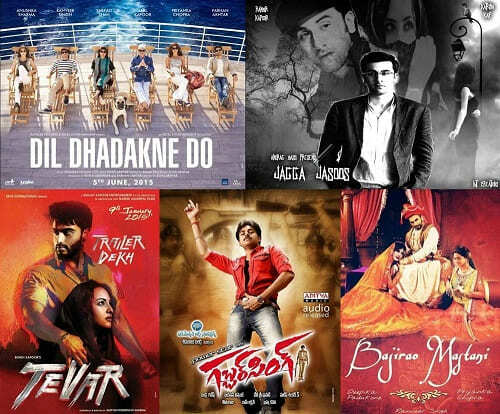 Here, we list must-watch Bollywood movies 2015 as well as guide you to rip Bollywood movies (2015) DVDs with the best Bollywood movie DVD ripper for have a great movie enjoyment on PC/Mac or portable devices hassle-free. Assembling Bollywood famous stars including Ranveer Singh, Priyanka Chopra, Anil Kapoor, Shefali Shah, Farhan Akhtar hand Anushka Sharma, Dil Dhadakne Do is recognized as one of must-watch Bollywood movies 2015. The director Zoya Akhtar portray tale of a cruise trip of a dysfunctional Punjabi family. This mega budget movie is firstly shot on a Cruise Liner Deck 7 throughout Europe and then on land in Turkey, finally in Mumbai for schedule. Firstly announced in 2003, Sanjay Leela Bhansali eventually makes his dream project Bajirao Mastani for over 10 years later narrating a romance tale of Baji Rao I (Ranveer Singh), Maratha Empire Peshwa and his second wife Mastani (Deepika Padukone). Started with principle photography shot in September 2014, this film is expected to released on 2015 Christmas and becomes one of the most awaited Bollywood movies 2015 around Christmas season. Production Company: SLB Films Pvt. Ltd.
Apart from the above top 5 must-watch Bollywood movies 2015, a number of excellent Bollywood Hindi movies in every genre will be introduced with super stars in 2015. Best Bollywood Movies 2015 for Jul. - Sep.
Best Bollywood Movies 2015 for Oct. - Dec. If you are troubled with how to backup your Bollywood movies collection on DVDs for long-time storage or playback on PC/Mac, portable devices more smoothly, WinX DVD Ripper Platinum, one of the leading DVD ripping software enables to rip any DVDs including latest copy-protected commercial DVDs to MP4, H.264, AVI, WMV, iPhone 6/6 Plus, iPad Air 2/Mini 3, Google Nexus 6/Nexus 9, Samsung Galaxy S/Note, HTC One, PS3/4, Xbox etc, with high audio/video quality at a very high speed. It is able to copy any Bollywood movies DVDs to ISO image, VIDEO_TS folder and a single MPEG2 file from main/full titles.